FSU economists found that the Church and its members in the Tampa Bay area had an overall economic impact in 2013 of $916,692,624 and create and support 7,514 jobs each year in the Tampa Bay area—providing paychecks to families that total $337,795,577. The Church of Scientology’s annual economic impact on the Clearwater area is almost $1 billion, according to a new study conducted by Florida State University’s Center for Economic Forecasting and Analysis (CEFA). 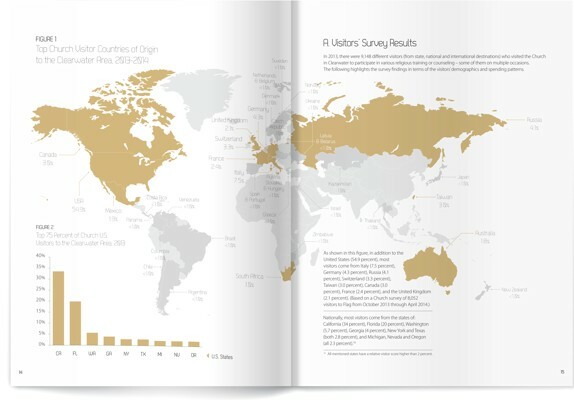 The financial analysis provides the most authoritative insight to date on both the Church itself as well as statistics associated with about 23,000 Scientologists who live in the Tampa Bay area or visited the Church in Clearwater in the last year. The Church has commissioned similar reports in the past—most recently in 2007. But with the inauguration of the Scientology cathedral, the Flag Building, in November 2013, the Church has entered a new phase of international expansion. That prompted Church leaders to seek a new and far more comprehensive analysis, and thus they commissioned FSU’s team of economists. As amply documented in the CEFA study, the annual impact of the Church is enormous: $916,692,624 in 2013. Spending on goods and services for the Church operations each year totals $54,500,785. 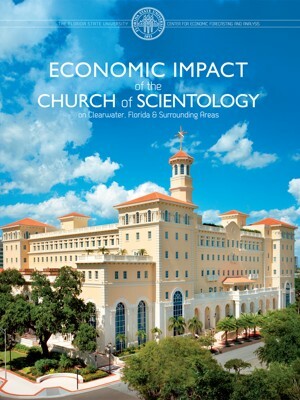 Economists from Florida State University examined massive amounts of financial records, along with surveys and interviews, to profile the impact of the Church of Scientology and its members in Clearwater, Florida. Businesses created by Scientologists have revenues of $287,919,612, money that is used to hire employees, and purchase materials and expertise. Scientologists annually contribute $87,867,000 to charitable endeavors, money that uplifts the quality of life in Clearwater. Put another way, the Church and its members create and support 7,514 jobs each year in the Tampa Bay area—providing paychecks to families that total $337,795,577. And those are good jobs—on average about $45,000 a year, according to the FSU economists. The CEFA report itemizes the assets Scientologists bring to Clearwater. It’s an affluent group, with a median income of $63,675, much of which is the underpinning for businesses, schools, charities and entertainment in the area. Church residents spend $100,344,512 annually on housing, $57,906,206 on household expenses, $39,544,304 on shopping. Getting a grasp on those numbers was part of the motivation for the Church to commission the report. The Church—along with most Clearwater business, civic and political leaders—encourages an influx of new housing, retailing and business opportunities. The hefty numbers contained in the CEFA report are exactly the sort of numbers developers and entrepreneurs want to see before investing in a community. Scientology’s total annual impact on the Tampa Bay area—almost $1 billion—has grown each year in excess of 10 percent. That means stability for the community. When the national real estate recession hammered Florida, the Church from 2007 to 2013 spent $252,260,468 on construction, restoration and renovation projects—meaning a lot of Tampa Bay area companies and their employees found work. The current FSU analysis was preceded by studies conducted in 1999 and 2007 by other independent economists commissioned by the Church. The FSU study includes a comparison of their findings. It shows a stable pattern of accelerating growth, regardless of economic ups and downs in society, doubling every seven years [see chart below, right]. Many cities are propelled to greatness by the presence of a single institution—a government capital, a university, a dominant industry or company, a large military base, a medical center, and, occasionally, a religion. Numerous towns—Cambridge, Massachusetts, South Bend, Indiana, and Gainesville, Florida—wouldn’t be much without their universities. Cities such as Fayetteville, North Carolina, and Columbus, Georgia, depend heavily on sprawling military installations. Other communities draw quality growth from a large enterprise—such as Intel’s headquarters in Hillsboro, Oregon. Tallahassee, Florida, would hardly exist without state government. The Church and its parishioners have produced a cornucopia of riches for Clearwater—a reliable, stable source of money and jobs. Along with that, the city has strong foundations: In addition to its world-famous beaches and tourism industry, it has a burgeoning high-tech and entrepreneurial contingent, performing and fine artists galore, and exemplary civic leaders. Clearwater, Florida, is such a city. For four decades, the Church of Scientology has built its presence in Clearwater, creating and renovating buildings with stunningly beautiful ambience. Successful cities know how to leverage their institutional anchors. Vision transformed San Jose, California, into “Silicon Valley.” Coral Gables, Florida, used the University of Miami’s presence plus a handful of internationally oriented businesses to make the city a go-to place for global commerce. The message to Clearwater in the FSU economists’ study is simple: Let’s all flourish and prosper together.